The MotoGP race at Phillip Island was set to be a thriller from the word go. To begin with there was a very real chance that Marc Marquez would be able to clinch his first premier class title, becoming the first MotoGP rookie to win the title since King Kenny Roberts achieved the feat back in 1978. Then, there was also the fact that the race was one of those rare MotoGP races that would feature mandatory pitstops. Why? Because Bridgestone couldn't guarantee that their tyres, especially the rear hard compound tyres, would last the entire race distance with overheating issues. This necessitated a pitstop for a bike swap no later than the end of the 10th lap, a first for a dry MotoGP race. 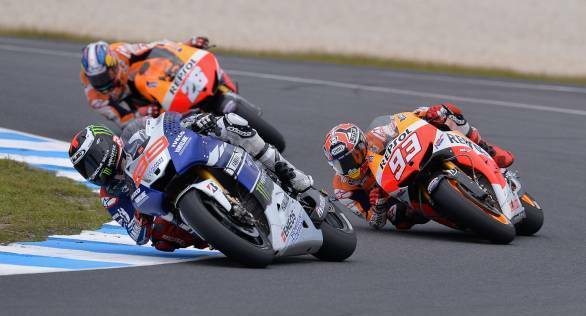 When the flag was waved at Phillip Island, it was Jorge Lorenzo who made a flying start from pole position, leading from the following pack, as Jorge so often does. Behind him, Marc Marquez and Dani Pedrosa slotted into second and third positions. The battle lines were drawn, and given that the race had been truncated from the original 26 laps to 19, the frontrunners had only so much time within which to seal the win. When it was time for a motorcycle change, before the end of the tenth lap specifically, Jorge Lorenzo was the first into the pits, vaulting off his Yamaha and onto the spare motorcycle, dashing out into the lead once again, while Pedrosa was in hot pursuit in second place. Marquez, however, pitted by the end of the eleventh lap. When he came out of the pitlane, there was a bit of a clash between him and Lorenzo, with Lorenzo coming out ahead. A few laps later though, the mistake made by the Repsol Honda team and Marquez had been found out. Marquez was blackflagged, made to return to the pitlane and his race was over. His championship lead was cut down to a mere 18 points, giving reigning world champion Lorenzo the chance to retain his title. The battle for the 2013 championship will now go down to the wire at Motegi and Valencia. Finishing third was Valentino Rossi, taking his fourth podium of the 2013 season.